Your Oyster Recipe of the Day: Grilled Oysters with Smoked Sausage Slaw. Chef George Reis of Ocean and 5 Point Public House Oyster Bar created this recipe especially for tailgating! He grills oysters with Parmesan and butter for a few minutes. After removing them from the heat and adds a cabbage slaw made with beer mustard and diced Conecuh sausage, then tops them with crushed potato chips. Fun and yummy! Combine cabbage, carrot, diced Conecuh sausage, and beer mustard. Mix until vegetables and sausage are coated. Combine room temperature butter and parmesan cheese. Shuck oysters then place on a hot grill while still in their shells. While the oysters are grilled, spoon the butter and parmesan mixture onto the oysters. Grill for 4 minutes and remove from heat. Crumble potato chips and sprinkle atop the oysters. TIP: If you’re grilling these at the game, brown your sausage and prep the slaw the day before. Chef George Reis owns Birmingham’s 5 Point Public House Oyster Bar and Ocean restaurant. Reis won the first Alabama Seafood Cook-Off and represented the state in the national 2015 Great American Seafood Cook-Off. Ocean is one of Birmingham’s most recognized restaurants, winning multiple awards including Best Chef and Best Restaurant, not to mention a regular winner of the Award of Excellence from Wine Spectator and Winner of the AAA Four Diamond award. 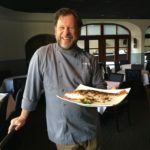 Don’t miss George’s other oyster recipes: Oyster Stew with Biscuits, Oyster Cakes with Lemon Turmeric Aioli, and Cornmeal Crusted Fried Alabama Oysters. Find dozens more grilled oyster recipes, (including the Easiest Grilled Oysters. Ever.) toppings and cooking tips from your favorite magazines, chefs and cookbooks.